Are you tired of feeling like the invisible singer? Wouldn’t you like to command the spotlight on and off the stage? Renée Fleming has it. Anna Netrebko has it. And no, I’m not talking about recent, internationally televised performances. The “it” is charisma. Furthermore, it is charisma and confidence that creates allure. It is the sense of being drawn to another person. Allure isn’t solely based on exquisite features or a superior IQ. Those both help of course – no one is going to deny that Nathan Gunn’s good looks make him more enticing. A true diva has “it”. You are going to actively cultivate it. Watch out world: no more invisible diva. “The audition is never over” is the main reason you want to increase your charisma quotient. The audition isn’t over in the lobby. It still isn’t over at the cast party. You are not aware of your conversation partner’s various connections at any given moment. For example, I idly chatted with a Baltimore-based bartender for quite a while before he divulged that his only brother worked for the Opéra national de Paris. “The audition is never over” statement is not designed to make you feel overwhelmed and helpless; but rather, give you the motivation to practice your most-charming self in everyday situations. Think about your colleague who lights-up the dullest post-concert reception. We will pretend it’s just je ne sais quoi. It’s really je sais charisme. Observe and learn from those that you find the most charismatic. You do not have to mimic their actions, speaking-style, or look. Simply identify what it is you find most engaging about them and see how you could apply that technique to your own life. You are good, worthy, and valuable. In your self-assessment and digital press kit, you outlined many wonderful things about yourself. There’s no room for feeling unimportant. You must absolutely know deep within yourself that you are worthwhile. That is your magnetism. That is what makes someone else cross the room to be included in your conversation. Self-confidence does not require that you dominate the conversation – just that you are enthusiastic about the things that are important to you. The adage, confidence is not cockiness, still holds true. 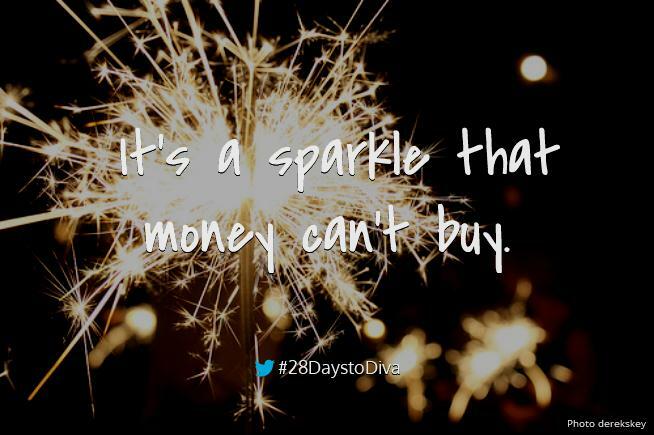 29 Days to Diva: Day 7 – Audition like you mean it began with, “The most sublime comment I have ever heard from an audition panel was, ‘Wow. She really came to play…’” That comment is about so much more than the singing. It begins with the moment that you walk into the room. It is the same way in regular social situations. Perhaps you recall my Simon Doonan story from 28 Days to Diva: Day 17 – Make an Entrance in which he advises, “Enter a room as if you are entering a room.” Camp really works for Simon Doonan because he does it authentically – a dichotomy that truly does exist in him. Find “your look” and “your body language” so you feel comfortable and confident. Charisma is not necessarily a fake-it-til-you-make-it skill set. You need to commit. Throw your shoulders back, look up, and smile. If you look open and approachable when you want to be approached, you will see the desired results. Finally, use eye contact to your advantage. A man with integrity is not afraid to look someone else in the eye. Be a good undercover agent. Listen attentively to your conversation partner. What is she telling you in her words, body language, and subtext? Be honestly curious about what she is saying. Singers are natural story-tellers but you should encourage her to share her enthusiasm – not just oversharing yours. Make your counterpart honestly feel like they are the only person at that moment and your interactions will exponentially more meaningful. Another definition of hell is two interesting people not being able to get past the weather and how busy they are. Show others the kind of attentive listening that you would like to receive. Truly listening to your associate has the added benefit of preventing lulls in conversation. Many people fear this aspect of the conversation and it stunts their active charisma. When you were paying attention to her words, body language, and subtext you were picking up cues for other topics of conversation. Run with that. Charismatic individuals usually have an arsenal of personal stories with which others can relate. Self-deprecating humor is really useful but just make sure that it isn’t so self-deprecating that you diminish your personal value. Charisma is the light that shines from within. Charisma is indeed the glitter that runs through your veins, diva. You know that the audition is never over because you are on your way. You are actively choosing to no longer be invisible to those around you. Not in an audition. Not invisible on stage. Not invisible at the coffee shop, because you couldn’t possible be. Own it, honey. Have any tried-and-true methods for fine-tuning your charisma? I would love to read all about it in the comments below. Or, add some sparkle to my Twitter feed at @mezzoihnen or on the Sybaritic Singer Facebook page. I totally love these posts! Are you going to turn them all into a book one day? I’m glad that you find them interesting! Thanks for commenting. I’ve been mulling over a good collection of them.